If we could only grow one culinary plant it would be garlic, its is so useful, easy to grow, tasty in many recipes and is also good for you. The white fumigated garlic you can buy at every store is not a patch on good old home grown organic garlic. Grow some yourself and enter world of 'garlic heaven'. You do haver need to buy some good garlic bulbs to get good garlic, the stuff from the shop is not usually worth trying to grow. Garlic is easy to grow and sets or bulbs are readily available for sale online from a range of specialist garlic growers (including organic varieties). Planting and growing them in an allotment is easy. 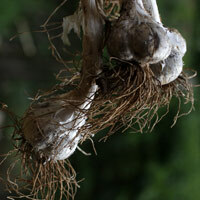 Home grown garlic has a fantastic taste so why not plant some this year. Growing organically is achieved by buying certified organic garlic and then by planting garlic in autumn using basic organic gardening principles. A well dug soil with a little added lime dug in 4 weeks before planting is probably the best way to produce a good crop of garlic for home use. A plant from the allium family that has been used for culinary and medicinal purposes for centuries, Allium sativum is the garlic used in cooking, but with over 200 varieties the choice is great, different intensities and flavours exist across the species. Generally speaking plant garlic in winter and harvest during summer after the bottom half of the plant starts to die back. A well cultivated soil to allow the garlic plant roots to go deep, a sunny position and dig in some well rotted cow manure. Plant 5cm deep, 10 - 15cm apart. Water garlic up until the first leaves start to change color. Harvest Garlic when the bottom half of the leaves turn brown, but the top half are still green. Garlic comes as 'softneck garlic', 'hardneck garlic' and 'elephant garlic'. Softneck Garlics include: 'silverskin', 'turban', 'chinese pink', 'transylvanian'and 'creole'. Hardneck Garlics: include 'purple stripe', 'porcelain' , 'italian purple' and 'russian red'. Elephant Garlics are large and can be roasted whole. So Hardnecks have the most flavour, Softnecks are easy to grow and last longer once harvested and Elephants are big. For ornamental garlics visit our allium page . Our favourite garlic... Porcelains, they have large cloves, great flavour and store well for a hardneck garlic. Striped Garlic such as Chesnok Red, Khabar, Gourmet Red, Metechi, Modova, Persian Star and Purple Glazer are very popular. Rocambole G arlics such as Baba Franchuk's, Dan's Italian, German Red, Korean Purple, Puslinch and Spanish Roja are hardneck garlics with a strong flavour, easy to peel but perhaps a little rough looking. Achatami, Acropolis Greek, Applegate, California Early, Chet's Italian Red, Chinese Pink, Early Italian Red, Flowerpot Garlic, French Tarne, Inchelium Red, Kettle River Giant, Lorz Italian, Nootka Rose, Polish White, Red Italian, Red Toch, Shantung Purple, Siciliano, Silver Rose, Silverskin, Silverwhite, Simonetti, Susanville, Transylvanian, Turban, Tuscan. Specializing in Organic Plants for Garden Allotments. Vegetable, Salad, Herb, Strawberry and Ornamentals.